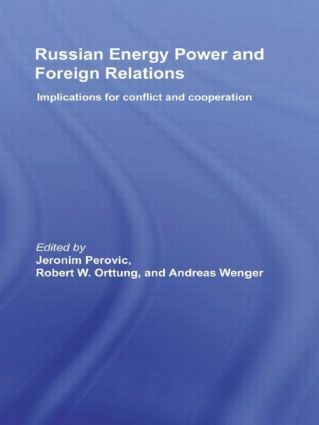 This book examines Russia's new assertiveness and the role of energy as a key factor in shaping the country's behavior in international relations, and in building political and economic power domestically, since the 1990s. Energy transformed Russia's fortunes after its decline during the 1990s. The wealth generated from energy exports sparked economic recovery and political stabilization, and has significantly contributed to Russia's assertiveness as a great power. Energy has been a key factor in shaping Russia's foreign relations in both the Eurasian and global context. This development raises a host of questions for both Russia and the West about the stability of the Russian economy, how Russia will use the power it gains from its energy wealth, and how the West should react to Russia's new-found political weight. Given that energy is likely to remain at the top of the global political agenda for some time to come, and Russia's role as a key energy supplier to Europe is unlikely to diminish soon, this book sheds light on one of the key security concerns of the 21st century: where is Russia headed and how does energy affect the changing dynamics of Russia's relations with Europe, the US and the Asia-Pacific region. This book will be of interest to students of Russian politics, energy security, international relations and foreign policy in general. Jeronim Perovic is a senior researcher at the Center for Security Studies at ETH Zurich. Robert Orttung is a visiting scholar at the Center for Security Studies at the Swiss Federal Institute of Technology (ETH) in Zurich and a senior fellow at the Jefferson Institute. Andreas Wenger is professor of international security policy and director of the Center for Security Studies at ETH Zurich. Developing Russia’s oil and gas industry: What role for the state?